Ed White Jewelers established in 1962 by the late Ed White Jr. located on Hwy. 31 north across from Clasic Cadilac and next to Enterprize Car rental. Our business originated in Decatur Al. by Ed White Sr. in 1942 known as White Jewelers. 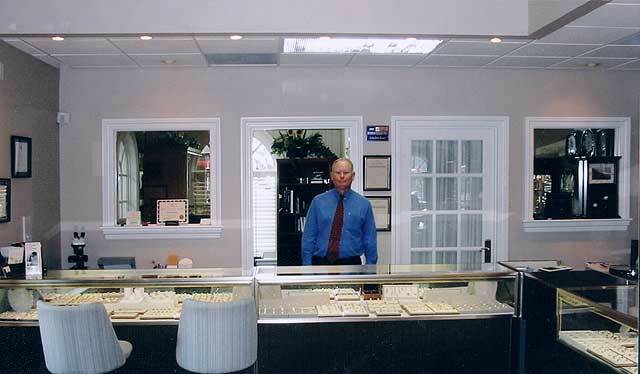 Our goal is to provide high quality jewelry and professional service to our customers at a reasonable price. We are a family owned and operated business with four generations of experience.Our service department has four accredited bench jewelers equipped with the latest equipment in the industry to provide in house repairs and custom work. Matthew White can work with you to do professional sketches and then turn them to the finished product...he has award winning designs in state and national completions. Our hours are Monday through Friday 8:30 am till 5 pm and Saturday 8:30 am till 4 pm we are closed on Sunday. You can contact us at 734-3661 or email us at edwhitejewelers@yahoo.com. Business owners: Richard A. White and Doris White Braudaway (Mom). We carry Seiko, Pulsar, Citizen and Swiss Army watches large selection of gold and diamond name brand jewelry with the largest selection of gold earrings in our area. We support St. Jude Hospital as our main charity.